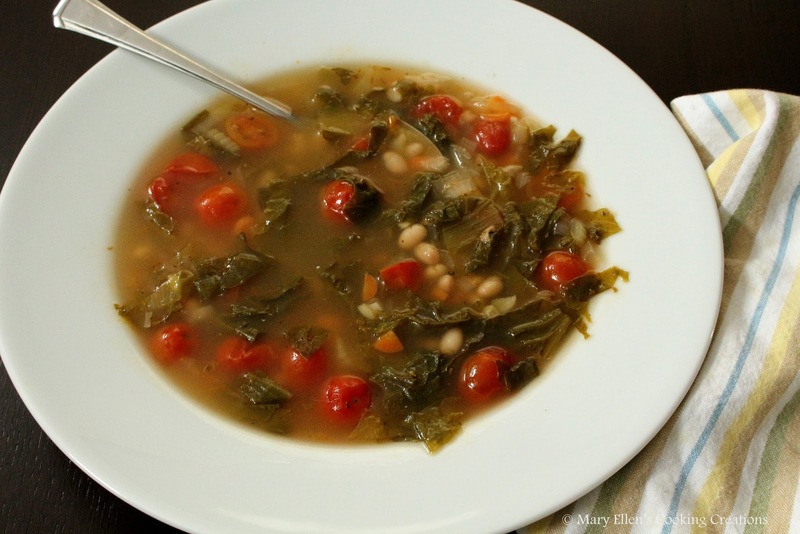 When I was buying the escarole for this soup recipe I realized that I had never cooked with it before. It's not a green I would think of to just saute with dinner, and I have mostly seen it used in soups and salad mixes. 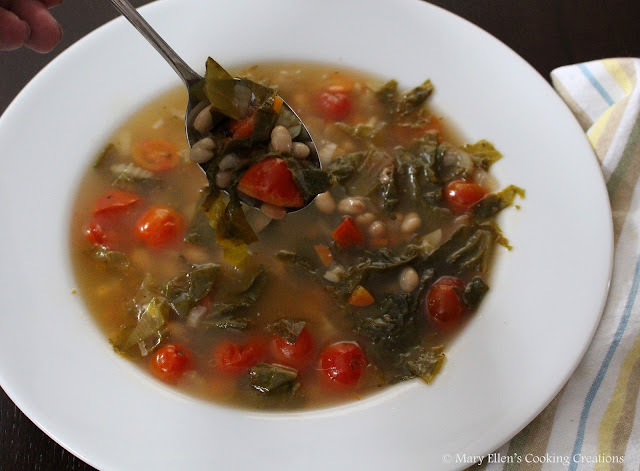 I knew what sort of flavor to expect, so I was looking forward to using it in this hearty but healthy soup. I found the recipe on the Eating Well site. I read the recipe and immediately changed some things, including the amount of broth. They called for two 14-oz cans of broth, but I knew there was no way a full head of escarole and 2 cans of beans mixed with 28 oz of broth would end up a soup. I wanted something brothy (and you can see from the picture it is still a veggie packed soup) so I doubled the amount of liquid and changed the amounts of the veggies. I really, really liked this soup as it was very filling and satisfying. The garlic added a great kick and the escarole really held up, adding nice texture. This is a perfect vegetarian soup, but if you want to turn it into a meaty meal, saute some hot Italian sausage and add it to your bowl. I prefer cooking the sausage separately, anyway, instead of in the soup so the soup doesn't get too greasy. Add the Italian seasoning and broth; bring to a simmer and let cook until the vegetables are soft, about 10 minutes. Stir in the beans and escarole, season with salt and pepper to taste, and simmer until the escarole is just tender, about 5 minutes.